some exclusions apply. discounts reflected in bag. 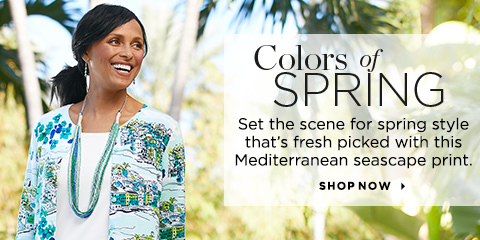 See what's new this season in one easy click and give your closet a jolt of color and style. Versatile pieces like jackets and draped sweaters boost your options for daytime work-wear, especially when layered with basics like essential tees and camis. Mix and match solid colors with prints, long with short, and business casual with weekend wear for a wardrobe that works every day of the week. Looking for a way to switch things up? Be sure to check out our dressy tops for looks that take you from day to evening in one easy piece. Add interest throughout the week with stripes, prints and patterns that bring out your personal style. We think you'll agree, our collection of tops is full of options that fit your life, your style and your shape, all in one place. Happy hunting!